All the talk about personal finances can be uncomfortable and stressful for some of us. Especially when everything looks long term. It feels like a giant mountain that you’d rather avoid. But climb we must. So, I thought I’ll share some of the things I did/do and that you can do today to make it all count towards that giant financial long-term goals. If you read my blog regularly, you know that I am a conservative when it comes to money matter. For me to feel financially secure, I need to know that my cash flow is in good health. When I started working on my personal financial health, I used the 10-10-5 percentage method of putting my money towards savings and investment. I have talked about it in my earlier blogs which you can read here but in particular on my blog about budgeting which you can read here. Having a second savings account where you save your 10% towards emergency fun is a good way of making sure you are not tempted to dip into this fund for unimportant reasons. This tie in with the earlier point. If your savings are automatically moved out of your current account into your saving/second account, you don’t see it, and therefore you are not tempted to use it. Unless you are disciplined enough to manually transfer money into your savings account, it’s best to automate it. This is a little trick I used when I was struggling to pay off my credit card debt a few years back. But it’s a habit I have continued even till date. We may not realize, but there are some habits we pick up just because… Just because everyone drinks coffee at an expensive coffee shop every day at work. Just because my friends are going shopping, I need to buy something to give them company. Just because there is another function of that distant relative, I need to buy a new outfit. Just because every family in our locality has two cars parked in their garage, I need two cars even though I am the only one who drives. By forgoing to buy just one item, big or small, every day you will be surprised how much you land up saving over a period of time. So, there you have it. 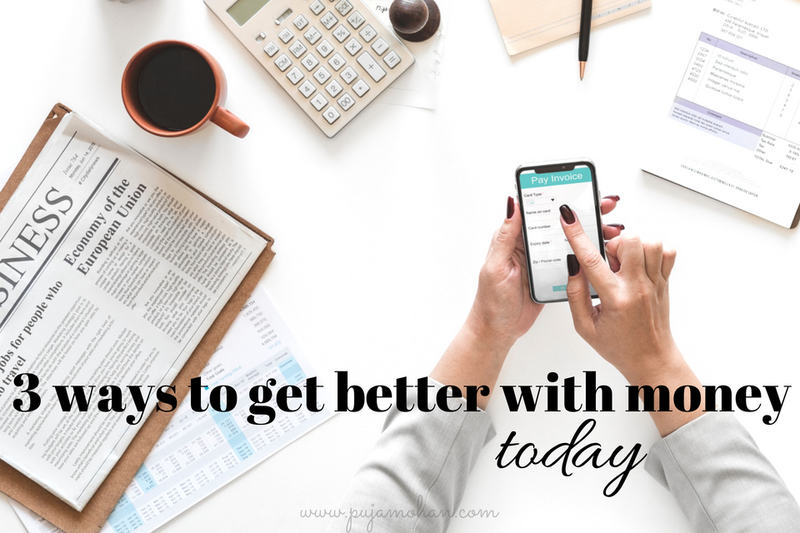 Three things that you can do today to get better with your money. What are some of the things you do daily that contribute towards your long-term financial goals? Leave me a comment below and let’s get the conversation started.